I’m a very lucky feline! I now have a mini-fleet of boats! My main boat and home, Nocturne, is a Tayana 37. She’s the perfect blue water cruising boat. She’s more than capable of crossing oceans, very comfy inside AND she’s beautiful! We lovingly nickname her ‘Noccy’. It was the legend Bob Perry who designed the Tayana 37s back in 1975. Nocturne was built in 1979. So she’s quite a lot older than me and she’s even older than my mum… she’s not older than dad though… he’s old! 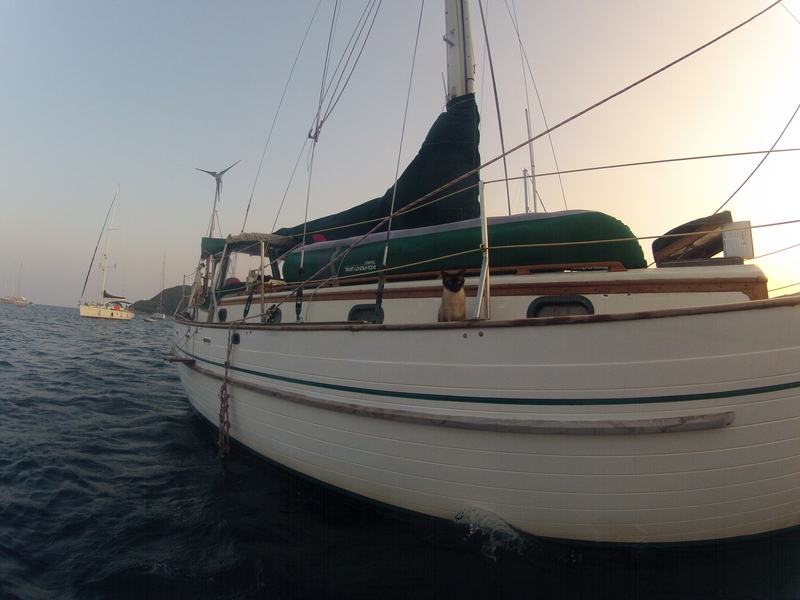 Nocturne is a full keeled double ender which means she’s very sturdy and comfortable to sail in, in any weather. The cockpit is small and secure with high coamings which offer protection from high seas, but I’m either below deck or in my travel case which is strapped in if we are underway! The interior below deck is, in my whiskery opinion, stunning. There are no two Tayanas the same as they were all semi-custom built. Obviously Nocturne is the best! My humans love the comfy V-berth and I love the top of the wardrobe. The saloon has lots of storage space and we have a full ships library that now includes my very own book! 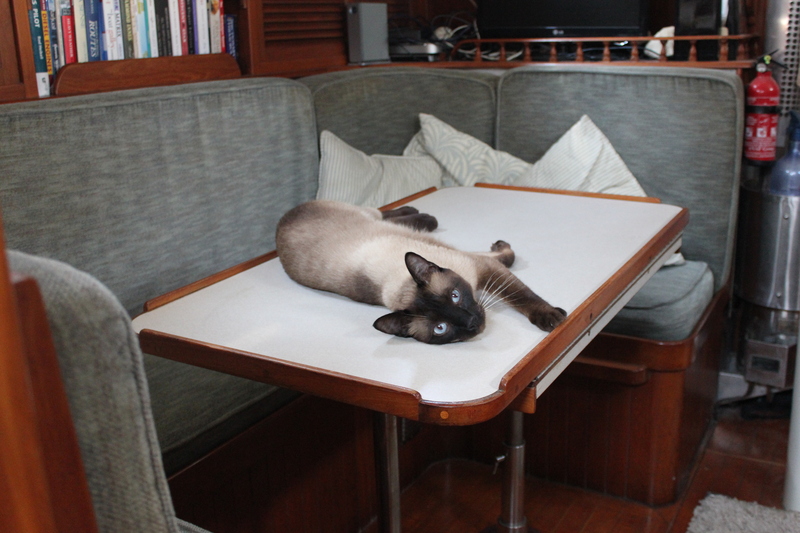 The table also drops down to make a double berth as well as the sofa on the opposite side so we can happily welcome guests on board. 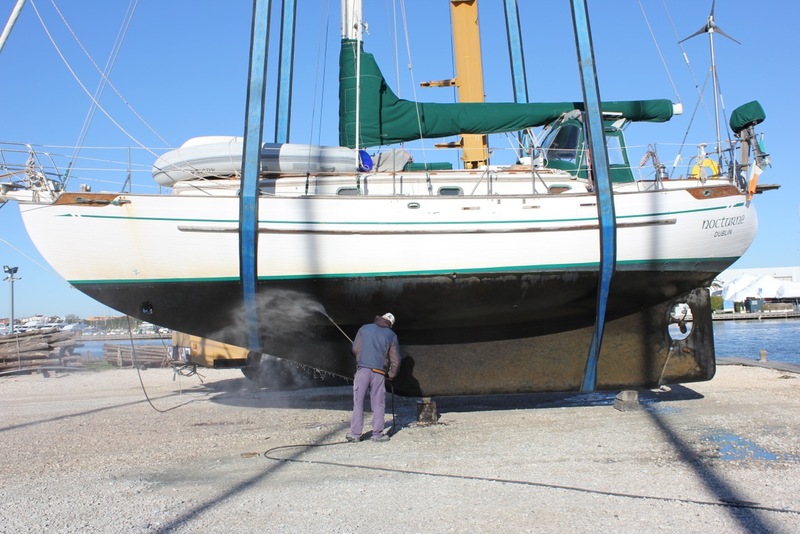 Nocturne was based in Seattle for most of her life and her previous owners have done lots of exciting trips in her including across the pacific. We have the logs of where she’s been and what they did and it makes really interesting reading. My favourite is the Alaska log as it seems so cool and different to our experiences in sunny Italy. Our main dinghy and family car is a Caribe MVP-10 (10 foot) with a Suzuki 15HP 4 stroke outboard. Her name is ‘Nippy’ because she can go really fast! She’s a fantastic boat in her own right giving us the possibility to go ashore quickly and efficiently whenever we want. It’s so powerful that if we ever need to, we could use it to tow Nocturne or help out other boats in distress. It’s pawesomeness is only let down by it’s size and difficulty getting it on and off deck (particularly the 45kg outboard). 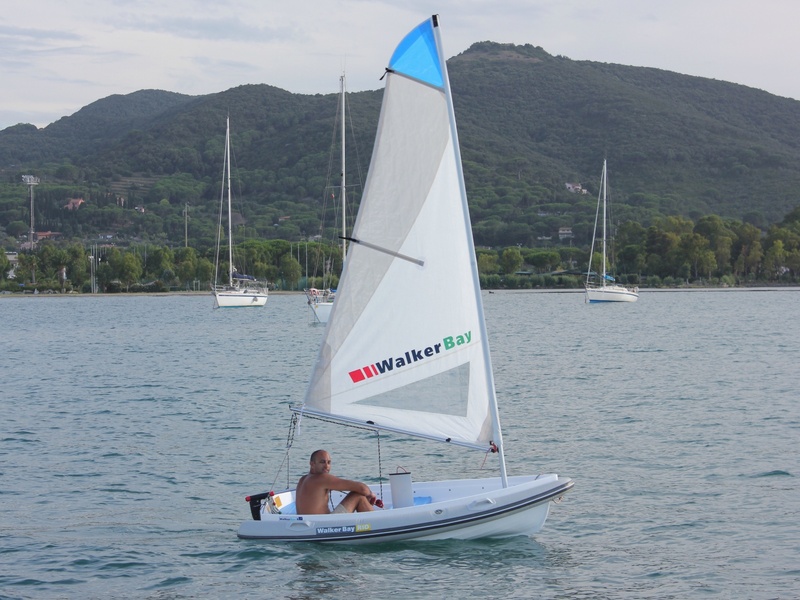 My purrsonal sailing dinghy and a wonderful addition to our feline fleet is a Walker Bay 8. We’ve named her ‘Nauti’ because without the wind she misbehaves! 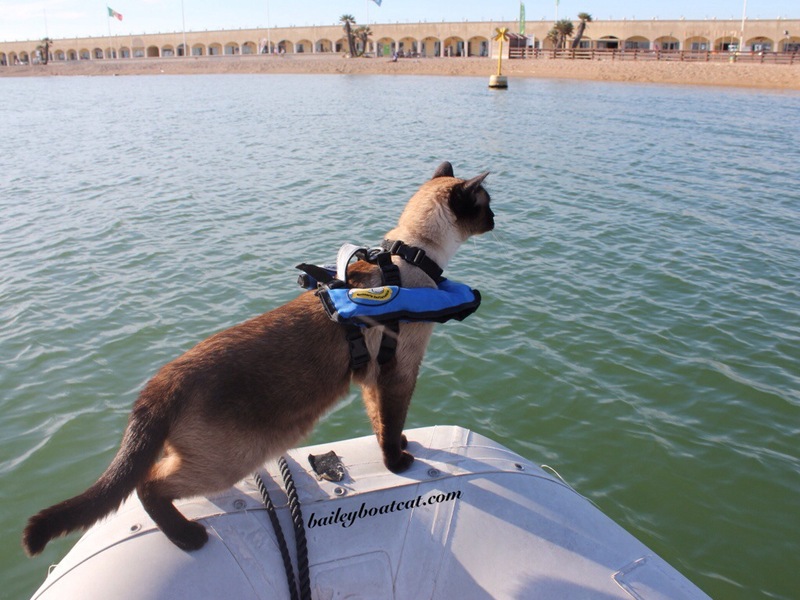 She’s purrfect for hours of fun sailing around and she easily converts into a cute little rowing dinghy when I feel the humans need more exercise! We also have ‘Nada’ a Sevylor Adventure Plus kayak, it doesn’t move unless the humans paddle! I prefer it to be on the deck though because it provides the purrfect shady spot! If it’s deflated it’s easily stored in the lazerette. Now that we’ve had to temporarily move off Nocturne, we have added a Cranchi Cruiser 32 to our growing fleet. 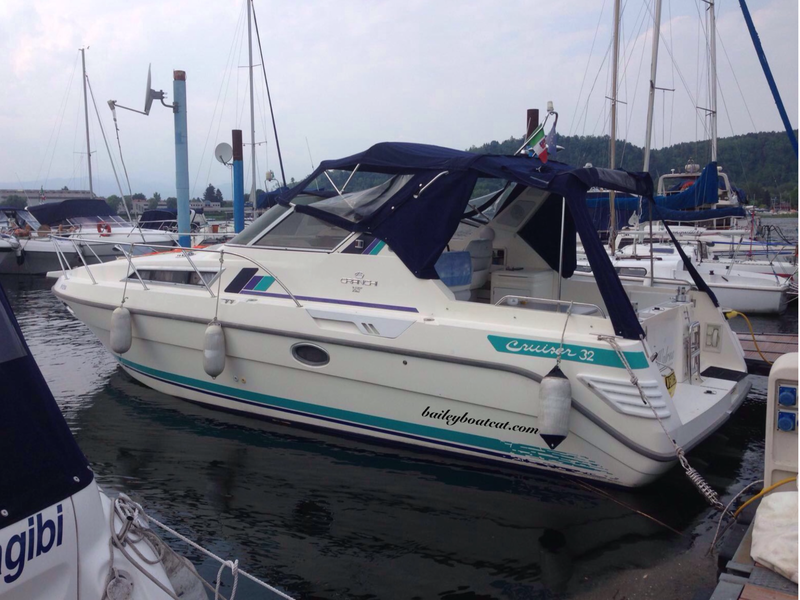 Her name is Walrus (her previous owners liked the Beetles song) and she’s purrfect for the lake… we are currently based by Lago Maggiore in Italy. The dogs absolutely love her because it’s easy for them to leap in and out of the water, but I still prefer my true love Noccy! We love Nocturne (and the mini-fleet! ), sailing, the ocean and life afloat! Thank you Dianda! Glad you agree! ‘Tis a beauty of a boat Bailey! No wonder you love it and your life at sea……. Beautiful photos. Looks like you are having some great adventures! Thank you! Yes I’m a very lucky kitty, loving life. The Nocturne is absolutely beautiful – picture perfect, the name is magical! And Bailey, you have the most beautiful dreamy-blue eyes! It sure doesn’t! What a great blog! !…….& cat of course!! Life really doesn’t get better! Thank you Cindy! 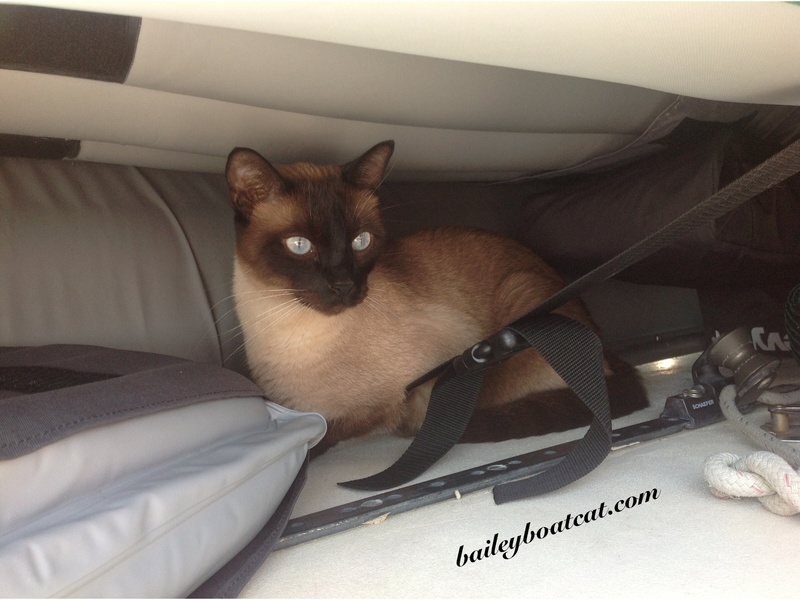 BBC – Love the boat and your Siamese. Had one too, the cat not the boat. Her name was Samantha. Here’s hoping you have a favorable following wind today. We love your boat Bailey!!!! Great looking vessel! When you taking off to go full time cruising? We’re three years away…counting down and getting more and more excited about it every day! Looking forward to following your blog. You can see ours at http://www.siochana.us. My human daddy has three little boats. haven’t been on them yet but it looks like fun. What a lovely boat Bailey. Lucky you!! That’s an awfully small boat to have two pet humans aboard. Do you let them sleep inside? 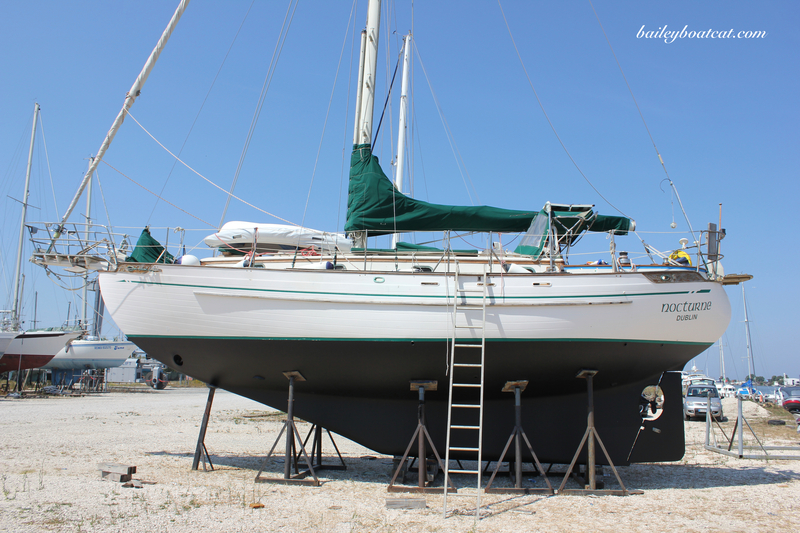 May your full-time sailing dream come true sooner than you hope! I’m no sea person, but this post is written very ‘up beat’. Well done. And have fun! Finding sail blogs is tough on here. Thanks for popping in at my place and I hope to learn some things as we prep for our adventure. Great boat. Beautiful cat. 🙂 Thanks for stopping by and liking my blog. You are such a gorgeous kitty, Bailey! And your boat is lovely! You are a fortunate Cat, I am sure you know that. Love your digs. Good thing about the teak decks — not to mention the ton or so of weight saved. 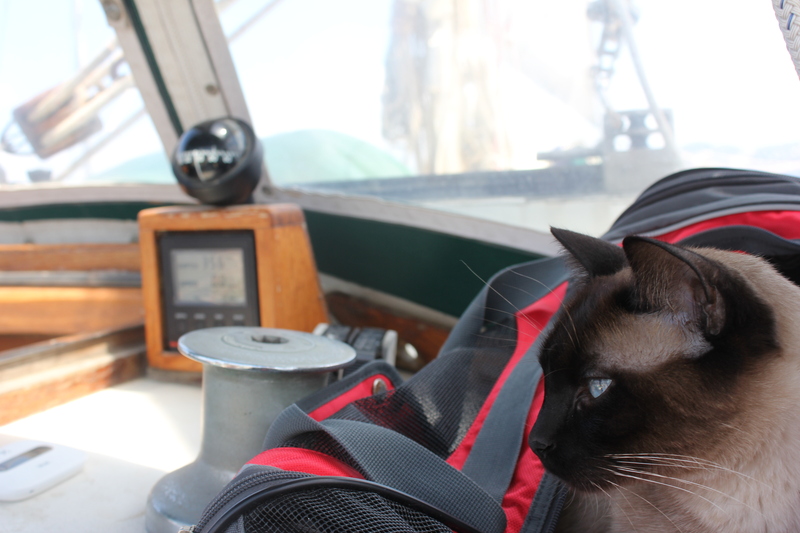 Nice boat, nice cat, and thanks for liking my firefly post. So glad you liked “We Ain’t Yachting Yet” on papermudandme.wordpress. I know the kind of life you lead because back in 1972 we launched the “Waiola,”a 42 foot cutter that my wife and I along with our son built. We lived on it for 8 years sailing between Hawaii and French Polynesia. – Aloha – pjs. We’re the nations first fully insured ‘pier to pier’ boat rental marketplace. We help owners offset the cost of boat ownership by renting their boat out to pre-screened qualified renters looking to create new on-the-water experiences. I look forward to hearing back! No wonder you’re proud of her! Beautiful boat! I used to live in Seattle, and–I swear–that boat looks familiar to me. Just found your blog and it’s always good to read about the Tayana 37 as we own a 1986 version as well. I’m looking forward reading through your adventures and for new posting of your travels. Hi Dave! Nocturne was built in 1979 and based in Seattle most of her life. She did the Pacific circuit and then made her way to Europe where we bought her in Italy. Which hull number do you have? Ours is 156. We have a lot of the old TOG newsletters maybe there’s some info in their on your boat too. Furabuluss page on yer beeloved Nocturne…she haz crossed da Pacific??? Mousiez dat iz pawsum!! 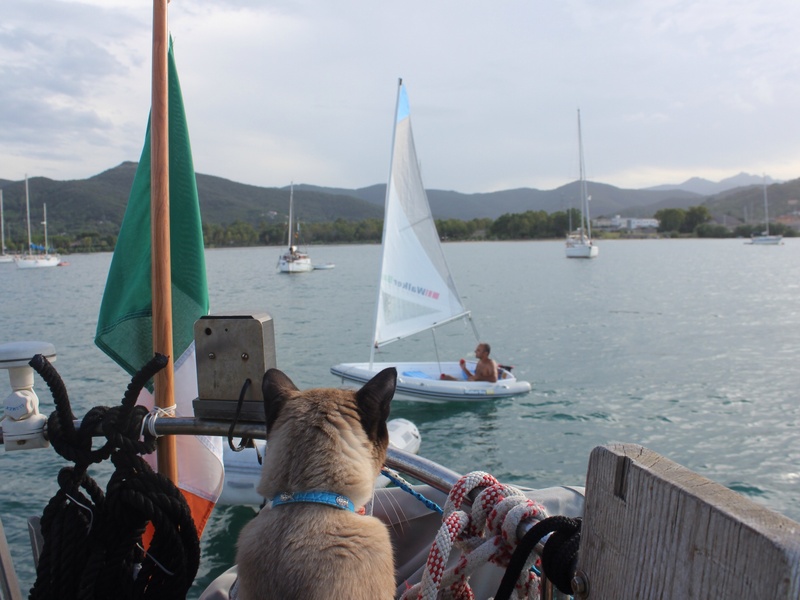 Sail on sweet Brofur Bailey,, sail on…..
Ahoy Bailey! That’s just the most fantastic adventure, I’d be keen see Italy this way too. I came by way of Hands On Bowie. My lovely friends from Belgium. Congratulations, I saw you have a book now. Very impressive. So I’ll just float around here a bit then. Bon Voyage! Wowzeh….what a home afloat. Looks like you don’t want for anything Bailey. The pictures were some of the best I’ve ever seen. Thanks bud. 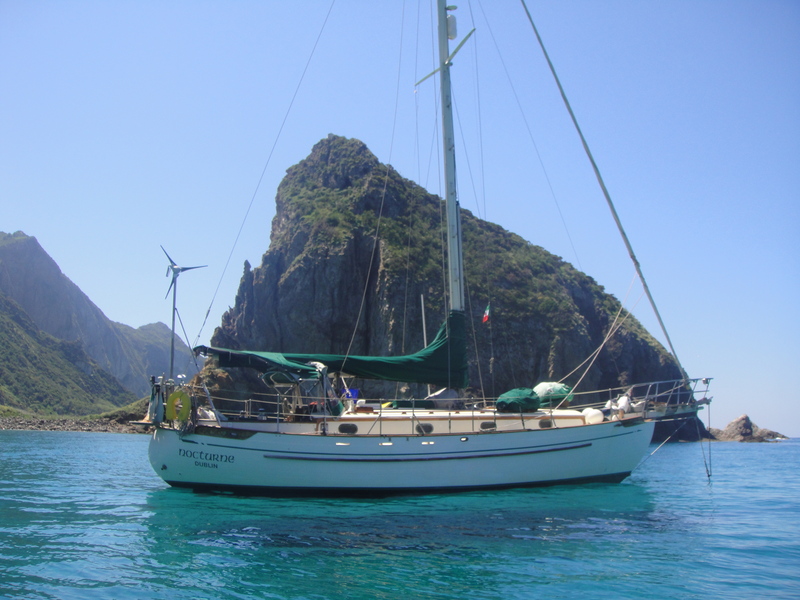 Our first boat was a Tayana 37 we loved her, fantastic boats and beautiful.